We recently toured 15 Royal Tern Road, Sea Pines and the Peabody Estate built by Francis Stuyvesant Peabody. 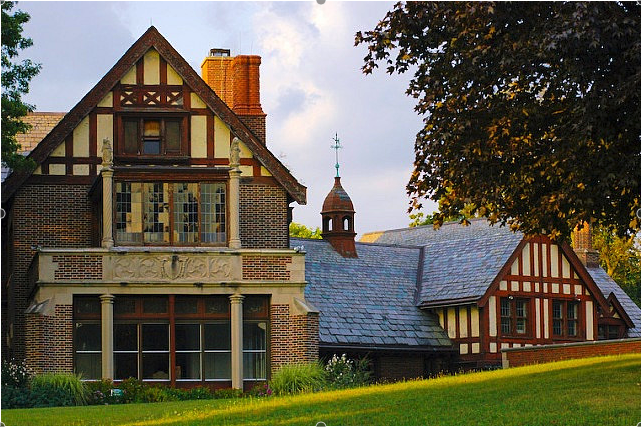 His 36 room Tudor Revival Style on 848 areas completed in 1921. F. S Peabody earned his fortune with the Peabody Coal Company. Always looking for new places to visit and seeing little parts of the world in my backyard, I ventured out with my adventure buddy April M. Williams. Woah….that was the first word out of my mouth when we walked into this time capsule. I think I even surprised our tour guides with my gasps. The beauty, foresight and opulence of this estate is really beyond words. Anyone can look up Mayslake and the Peabody Estate and get a bucket full of information. Taking a tour and hearing the “little stories” is worth a trip out to Oak Brook, Illinois. Peabody Estate in Oak Brook, Illinois. Photo credit: Peabody Estate. Social class, I guess, has always been a “thing”. Important. You’ll find this holds true when touring old mansions. Mr. Peabody’s bedroom, as the leader of the home is on the highest level of the home. Three steps up from Mrs. Peabody’s room. I’ve learned over recent weeks that husbands and wives often had their own sleeping rooms with private doors that connected them so guests and servants would not see the comings and goings. What I found so enthralling was the beautiful wood wall of shelves that hid Mr. Peabody’s great escape route. A secret stairway which led through the many levels of the mansion to the “world ending” shelter of the basement. No one truly knows why he had this safe room but it’s fun to speculate why. Upon leaving the master’s suite there is a progression of levels from the sleeping suites to rooms. Mr. Peabody’s, Mrs. Peabody’s, guest rooms, head maid and so on down, down, down. The rooms go from sheer opulence to rooms with just a bed. I must say though, all had spectacular views of the property. Besides the lowering levels there were other signs of rank, other than the obvious separate entrances for servants. The bedroom doors had beautiful door knobs and wood exteriors on the side leading to the hallways. However, on the inside of the rooms the knobs were plain, simple, white. A reminder to the staff that they were, well, staff. Subtle reminders. Nothing was overlooked in this mansion. The fire hoses built-in to many of the rooms and the built-in safes that could hold an army to the central vacuüm system. Wow, central vac in 1920! Who knew! 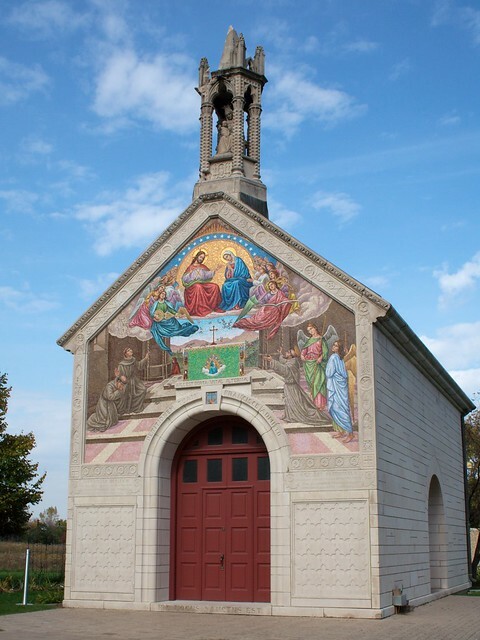 Chapel at Peabody Estate in Oak brook, IL. Photo credit Peabody Estate. These are just the simple, silly little things that draw me in and make me wonder about time gone by and the people who once lived. There is so much more but you should lean them on your own and feel the experience.